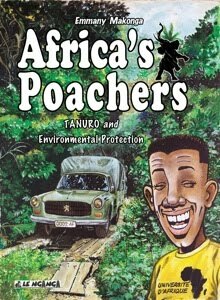 The Salt Lake Tribune recently posted this interesting article about Emmany Makonga's new book, Africa's Poachers: Tanuro and Environmental Protection. I haven't read the book, but it's certainly got my interest piqued, largely because I'm interested to see how the subject matter is handled. A lot of these types of things can get very preachy, and I like to see how different creators handle trying not to come off that way. (Or, by contrast, if they totally own their preachiness and just roll into it unashamed.) The book can be ordered for $20 here.